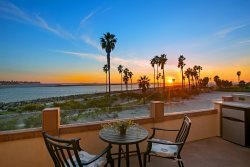 Centrally located and close to all of San Diego's most popular attractions, these are San Diego's most popular beaches for a good reason. The Boardwalk, Belmont Park, Mission Bay, Sea World, restaurants and beach boutiques, it's all here! This is the perfect place for your next vacation rental! Mission Beach and Bay and Pacific Beach are centrally located in coastal San Diego and home to some of the best activities around. Surfing, biking, boating, picnics, sunbathing, amusements, night life, beach front restaurants and all around fun is the best way to describe it. Click on the link below to see some of our favorite things to do! Spend time fishing Mission Bay, the largest man-made aquatic park in the USA, offering 27 miles of scenic shoreline for anglers to experience rod bending excitement year-round. The bay bite goes on throughout the entire year and you are pretty much guaranteed a bite, making it even more fun for the kids. So, bait up and get ready to hold on tight for the ultimate fishing adventure in Mission Bay.